Are you still thinking that there is no way to get yourself featured on Google Search engine? 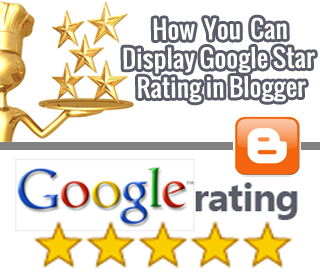 Have you ever seen those websites in Google Search results that have 5 little review stars on it? Review Markups is the permit that will make your website different from everyone. Just like the Google Verified author has significance in SERP in the same way Review markups provides reputable impact to the searchers. If we go in depth, Review Markups is more commonly known as the search engine star rating system which not only creates a positive impression in the minds of your visitors, but also make your website stand out in the search results. So, if you willing to improve the appearance of your Blog in Google Search engine then Review star markups is the receipt to get yourself highlighted in Search results. I know you are curious to check how your post will look once you applied the following tutorial so here is the live demo. Before we jump onto our tutorial, let us study few features of Review Markup plugin. Whenever, a person searches a certain keyword in Google his aim is to get the desirable result in just one click, and by placing review stars, we are allowing users to get to a place which has the most perfect knowledge. By adding review markups in a certain post you are telling visitors that it is a trusted page and the information present in this page is worthwhile. You will receive more traffic because you have the most unique presentation in the SERP with Review Markups. Installing review markup in WordPress Blog is extremely straightforward then installing it in Blogger, because there are numerous Plugins available which makes everything possible in WordPress. However, blogger don’t have robust plugins so here we will take help of chunk of HTML coding that will work as perfect as the Plugins available in WordPress. Step#2: Then copy and paste the following HTML code in HTML tab of Blogger post editor. Replace Name-Of-Product-(You are reviewing) with the title/name of product that you are reviewing. Replace Reviewer-Name-Here with your name that you want to see in Search results. Replace Aug 11 2012 with the current date along with 2012-11-08 in YY-MM-DD format. And the last but not the least, replace Your-Stars with the number of your ratings. Mean how many stars you want to give to your product but keep in mind, that you must have to give review out of 5. All Done: Now finally publish your post and wait till Google bots crawl your website. It totally depends on your new post indexation, if your new posts are index within 2 minutes then you can see those review starts on the specific post. Google Introduced Rich Snippets Tools so that bloggers and webmasters can preview how their Blog or Website URLs would appear in Search engine result, but still majority of the bloggers are still unaware of this tremendous tool. Step#3: Now, the next step is to verify that you have done everything correctly? So, to do so use the Google Rich Snippets Tool to see how your post result will look in Google. One more thing keep in mind that you have to do so with each post individually. And the rating words will also appear at the end of your post. Hope you will like my first tutorial on MBL (My Blogger Lab). Leave your precious comments and questions (if you have any). Till then Peace, blessings and Happy Staring. Hi Saqib, I just want ask you. Should I put the code at the beginning of post or end of post? Don't you think u have to add some css so it will looks pretty good after post!? Great Article! it will good to put this piece of code in a regular html page? google will add the stars in the search results? Thank you! I'm using Wordpress but I needed the HTML markup code for this. You're the best! But what if I don't want the rating words to appear at the end of the post. Any way to do that? i just want to know, its not possible to add this code older posts, is there any other method to display the rating for all posts (including older posts)...??? but got a question hope you only can solve it! as per your instruction when i placed the code at the end of html of my blog post it is showing fine in snippet tool i am happy with that. i only want my hreview markups to be shown for blog posts where i use not for entire blogspot.com. To solve this problem do as Followers. Go To Blogger >> Your Post >> HTML TAB >> Paste the Following Coding. 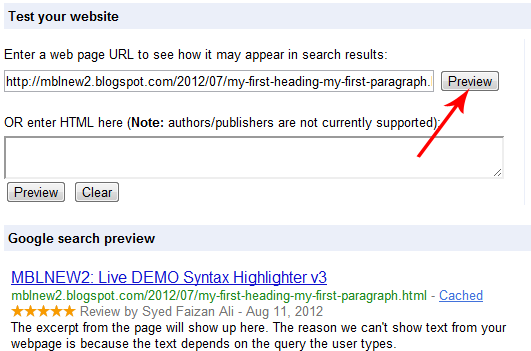 Only this blog can describe it clearly..
You can Always Check it through Rich Snippets Testing tool. If its working fine there, than wait for a while. You will soon see them on the Search results. I've tried and didn't worked for me. Everything done as your instructions..
have you any idea or how to put this automatically on each post? Hi,How can I use this feature in a specific content management system that I built from scratch? Successfully integrated to my blog. Thanks it really helped a lot! !